A Year of Reading: Poetry Friday Roundup is Here! from your smooth grey bark. This is my 2nd round poem from the Madness! 2012 kids' poetry writing tournament, along with the redbud in our backyard that saved me from writing a poem about dandelions. A tip of my poet's hat to Elaine Magliaro, champion of the List Poem form. You're still a great teacher! Voting for the Second Flight of the Regional Semifinals remains open through today! Add your Poetry Friday links in the comments. I'll start rounding them up as soon as you start sending them in! Jone is looking for recipients for her students' Poetry Postcard project in April. Go to Check it Out and sign up! It's fun! Robyn has cherry blossoms -- and A.E. Houseman -- on her mind at Read, Write, Howl. Julie shares all three of the poems she's written for the Madness! 2012 poetry tournament over at The Drift Record. We "shook hands" via email before we got our words and agreed that no matter which poem won, we would have fun. Julie is an amazing (Capital-P) Poet and I am honored to have played a round with her! April continues the Teaching Authors tribute that this blogging group has been giving in honor of team member Jo Ann Macken. Charles shares his collection of poetry books for adults at Bald Ego. Linda is combining Slice of Life and Poetry Friday today at Write Time with a poem she's written for her DARLING granddaughter, who just turned two. At Random Noodling I have Donald Hall's "O Cheese." Kids of the Homefront Army continues with "Selective Service." Kurious Kitty has Richard Wilbur's "The Writer." And, Kurious K's Kwotes' P.F. quote is by Rita Dove from the introduction to the The Penguin Anthology of 20th Century American Poetry. At The Write Sisters we have a delightful poem called "Shadow Dance" by Ivy O. Eastwick. Tara, at A Teaching Life, is also combining her Slice of Life with Poetry Friday. Like Robyn, she has cherry blossoms on her mind, but she brings us some Billy Collins to enjoy while the petals flutter down. The bloggers at Gathering Books are celebrating Women's History month. Myra brings us a poem and a song that have her thinking about women's voices and women's silences. Linda at TeacherDance is writing a series of poems of goodbye. Her poems say goodbye to different stages of growing up, and are written for her grandchildren. Linda is also a Slice of Lifer. Violet shares an original "grandma" poem titled "To Liam when he asks, What's green?" It's at Violet Nesdoly / Poems. Oh, YAY! David Elliot has a new book of poems, this time about the sea. Mary Ann, at Great Kid Books, gives it (and Holly Meade's illustrations) a glowing review. At The Opposite of Indifference, Tabatha is linking poems with favorite book characters. She starts things off with poems that Hagrid, Calvin, and Hobbes each might have chosen. My fourth graders are her first guest contributors. They chose poems for the main characters from A Wrinkle in Time. Watch for more in this series, and if you want, you can play along, too! Greg serves up a strong cup-o-Joe at GottaBook -- one of his poems from the Madness! 2012 poetry tournament. He is "versing" Susan Taylor Brown in the regional semifinals. Their poems will be live and ready for your votes at the tournament site, Ed DeCaria's Think Kid, Think, later today. Heidi praises the process of "the curious and wonderful phenomenon that this March Madness has become" (the poetry tournament, that is) and shares a priceless poem composed by one of her kinders. Her blog's name -- my juicy little universe -- seems particularly apt today. At Growing Wild, Liz has an original poem that will appeal to all cat lovers! Jama has some drool-inducing strawberry shortcake for you today...if you have enough time to read that far! Be prepared for a laugh today at Jama's Alphabet Soup. Renee shares an entomological love poem ("The Moth and the Flame") by the "pre-published" poet Cathy Mealey. Stop in at No Water River and enjoy the poem, the interview, and be sure you click through to see how Cathy met the rhyme challenge Renee offered up! Carol's Corner is blooming with daffodils today! She's got a Ralph Fletcher poem for us, from a book with a title I adore: ORDINARY THINGS: POEMS FROM A WALK IN EARLY SPRING. Welcome to Poetry Friday first-timer Natalie, who blogs at Wading Through Words. She discovered this fabulous community by participating in the poetry tournament at Think Kid, Think! She's got an original poem for us today, to make a monumental occasion in their household. The photo makes a great punchline! Speaking of the poetry tournament, at Mainley Write, Donna shares an amazing grouse story that lies just behind her winning first round poem for the tournament, "Fox and Grouse." Joy has a dream poem and a writing exercise for us at Poetry for Kids Joy. Happy belated World Poetry Day (March 21)! Sally, at Paper Tigers, shares a site that features the seven winners of a poetry-writing contest inspired by the ancient poet Eratosthenes. Pentimento shares a starting-over-in-Spring poem by Steven Kestenbaum. Sherry, at Semicolon, has a great quote about form in poetry and Tennyson's "Ulysses." Amy LV has written a poem that came from a seed planted in her writer's notebook TWELVE years ago! She also shares some happy publication news today at The Poem Farm. Books 4 Learning reviews MIRROR, MIRROR by Marilyn Singer: "Mirror Mirror is a celebration of the vigor and potential of language." So true! Karen Edmisten shares a different sort of starting-over-in-Spring poem by Gary Young. Compare/contrast with the one Pentimento shared (above). Turn and talk to your neighbor. Sing along to "Gold," by Fergus O'Farrell with Little Willow over at Bildungsroman. This song can be heard in the film ONCE and the new stage adaptation of ONCE, which is now on Broadway. Little Willow shares links, in case you need some help with the tune! At Wild Rose Reader, Elaine has an original acrostic using the word bud, and proud-grandma pictures of her family's little bud! Laura (Author Amok) writes: "To celebrate spring, I have a gardening poem by Susan Hendrickson and an invitation to participate in my 2012 National Poetry Month Project, 30 Habits of Highly Effective Poets (odd or practical, you choose)." Spring is bringing rain and a Sara Teasdale poem to Dori at Dori Reads. Lori Ann Grover has two links for us today: "Little Bobby Snooks" at readertotz, and "Periscope" at On Point. At Musings, Joyce reviews Paul Janeczko's REQUIEM: POEMS OF THE TEREZIN GHETTO. She's right -- it's not a fun book, but it's definitely an important book. Betsy, at Teaching Young Writers, has a sidewalk chalk haiku for us today! Thank you, Ruth (at There is no such thing as a God-forsaken Town) for the Billy Collins TED Talk! I missed that one and now I will not have to go any further than your blog to watch it! 15 Words or Less are accumulating at Laura Purdie Salas' Writing the World for Kids. 100 Scope Notes is gathering book spine poems again this year for Poetry Month. Start pulling books of your shelf and get your camera ready! A slam-dunk review of Hoop Kings by Charles R. Smith can be found at All About the Books with Janet Squires. Kelly Fineman, at Writing and Ruminating, is the interviewee, instead of the interviewer now! Congrats!! Cathy has the perfect poem for the beginning of spring break, comparing the perceptions of eighth graders to first graders as they face a week away from school. You can find Cathy's poem on Slice of Life blog, Merely Day By Day. Can't wait to see your new poem!! Mary Lee, seriously, I do hope you are writing a collection of nature poems. I have to say that when I read what you have done with all your words in madness I always wish I had written them. Hello, my worthy opponent! Your Round Three Semi-Finals poem is currently skunking my poem made of kennings!! Ah, well, the thrill of victory, the agony of defeat. For Poetry Friday at The Drift Record I'm going to post all three of my tournament poems and add links to the current round so people can join in and vote. My own poems won't go up at The Drift Record until tonight after midnight, though I've explained the tournament and linked it in today's (Thursday's) post, too. I love your collection of kennings! I'm going to have my students try to write some (and I will, too!)!! Not only is your poem stunning, it's introduced this Southern Californian to Redbuds. Thank you! Over at www.TeachingAuthors.com, I've got a poem by JoAnn Early Macken and two folk songs about saying g'bye. Come by! p.s: I can't give you a specific URL until it posts late tonight. I'll come back on Friday and put it here. Thanks for hosting. I LOVE our Poetry Friday community!!!! I had never seen a redbud until I moved to Ohio. They blew me away when I saw those flowers coming straight out of the bark! They're an absolute favorite now! Hope to see a new book of buds. Hi Mary Lee- what a lovely poem! I agree with Susan, you need to write a collection of nature poems! 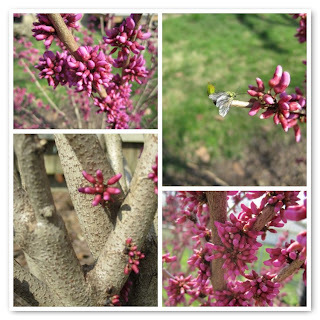 I've heard so much about redbuds, I'd love to see them one day. Your poem only reinforces my longing! My posts will go up after midnight. Sigh. I wish I could write a line as perfect as this. Just beautiful, Mary Lee. My post is doing double duty today, as a Slice of Life as well as a Poetry Friday effort - and I'm also in the Spring blossom spirit with a poem by Billy Collins. Hi Mary Lee, thanks for hosting this week, and congratulations on being a tough contender for the March Poetry tournament. Would I love to know what to do if I was a rosebud in spring. Mary Lee, I saw this earlier & loved the exact words that Tara quoted "explode whole constellations..." Beautiful! And that photo-whew! Thinks are so dry here & still blooming everywhere. What an interesting March! Here's my post: http://teacherdance.blogspot.com/2012/03/trying-to-put-all-best-words-in-best.html I'm sharing my second poem in my project about saying goodbye to different stages in children. Thanks for hosting! I'm newish (have joined in on Poetry Friday before but not for a long time). I love the photos to go along with your poem, and the last lines: "Add glory / to the understory" Nice! And so springy. I'm entering a 'green' poem I wrote called "To Liam when he asks, What's green?" It's here: http://wp.me/pC77F-gy (I think it will open now, but if not, it's set to publish at 5:a.m. Pacific time). What a fun competition! I love the images your poem brings to mind. The way you describe the redbuds exploding as stars makes me think of fireworks bursting in the sky. Just lovely the way one image links to the next. Over at Great Kid Books, I'm sharing In the Sea by David Elliott, illustrated by Holly Meade. What everybody else said, Mary Lee -- spectacular poem! Thanks for hosting, and for contributing to my post today! Folk songs, poems and a poetry prompt--write your own g'bye poem! Good morning from the East Coast! Mary Lee, are you on Spring Break? So much dialogue you have time for! Your redbud poem is beyond excellent, but I think we have to look to Bobbi Katz's work as well as Elaine's for the origins of this "Things to Do If..." form. Someone please correct me if I'm wrong. I'm posting today on the curious and wonderful phenomenon that this March Madness has become, and sharing a poem composed by one of my kinders. Yes, it's the end (wah) of spring break. If I should also tip my hat to Bobbi Katz, I certainly will, but it's Elaine's list poems I know best. Love your redbud poem, ML! It's perfection :). Thanks for hosting today and continued good luck with your March Madness! Hi Mary Lee! More gorgeous work from you and Julie in the tournament - so hard to choose! I have so loved reading all of the amazing poems from March Madness. Hope it's an annual event! Mary Lee, your two spring poems are some of my absolute favorites. I have to confess, though, like several other commenters, that I have never seen a redbud tree, and had to google it online. Was a little relieved to know I was not the only one lacking this knowledge. I wanted to write a poem about my fourth graders' experience yesterday at the museum, but that didn't quite work, so I published it as my SLICE OF LIFE and went back to an old favorite, "Daffodils" for my contribution to Poetry Friday. I loved your Redbud poem at the March Madness Poetry Tournament--such vivid imagery in so few words. I have been so inspired by all of the fun going on at Think Kid Think this week, that I decided to join in on the Friday Poetry Round-Up. This is my first time to participate. I have posted an original children's poem at my blog, www.wadingthroughwords.wordpress.com. This poem is exquisite! What a pairing between you and Julie. Man! Love the poem, Mary Lee! I'm in with a short one from Gary Young. It's here. Thanks for hosting today's round-up! Thanks for doing the roundup this week. Love your redbud poem! I have a "BUD" poem too at Wild Rose Reader. It's an acrostic. Thanks for hosting, Mary Lee. Love both the picture and the poem. I'm in with a little spring rain. And at On Point, I have my haiku for today, Periscope. Mary Lee, I love your spring poem - Burst First is wonderful. Good luck with your rounds. That kind of pressure seems daunting to me! At Musings http://joyceray.blogspot.com I've posted about Paul Janeczko's haunting book of holocaust poems, Requiem, Poems of the Terezin Ghetto. Not very springlike, but so important. Lovin' the poem, thanks for hosting the roundup. At Teaching Young Writers, I had a little fun with some sidewalk chalk! I've got the video of Billy Collins' TED talk from back in February. Has everyone already seen it but me? It's great - it includes animations of five of his poems. Here it is. Thanks for hosting! I've been wanting to join the Poetry Roundup since I started blogging. This seemed like the perfect time. (Can I Slice and Roundup?) Here's a poem about my observations as students left today for spring break. Yes, we're on spring break! But doing the roundup is a form of play for me! Plus, I could never do it justice on a working Friday! Slicing and Poetry Fridaying are a perfect combo. You're not the first to blend them! Dear Mary Lee - just wanted to say real quick how much I have LOVED your poems at March Madness! So SO lovely. I want to hear more and more of your poetic voice. I can't wait to see what you write next! Madness! 2012 -- Voting is LIVE!